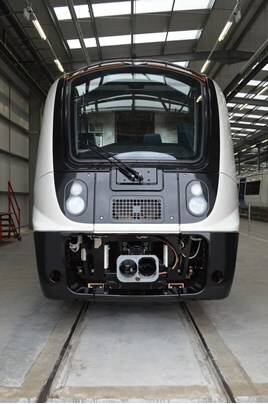 The first Crossrail electric multiple units were unveiled by Bombardier and Transport for London at Derby Litchurch Lane on July 29. The EMUs will enter traffic with TfL Rail from May 2017 on the London Liverpool Street-Shenfield route, and will be in traffic on the completed project from December 2019. The route is being rebranded the Elizabeth Line from 2018. “The Elizabeth Line trains, which are a great showcase of British design and manufacture, will be running on part of the network within a year,” London Transport Commissioner Mike Brown confirmed at Derby. The trains have been ordered as nine-car EMUs, but the first 15 will enter traffic as seven-car trains before being retrospectively extended to full length later in the delivery programme. Bombardier is delivering the shorter trains because the nine-car trains cannot fit into Liverpool Street’s suburban route until Platform 18 is closed and other platforms are extended accordingly. For much more on this, read RAIL 807, published on August 17. The Class 710 London Overground Aventra trains will also be the same as the Crossrail Class 345 except it will be 4 carriages and will have 2 doors per carriage and can operate on shorter platforms on the Romford to Upminster line with one door not operational whilst the rest of the doors are operational just like on the London Underground S7 & S8 S-Stocks used on the Circle, District, Hammersmith & City and Metropolitan lines as they have door select operation as the platforms are shorter and some doors can't open at shorter platforms with other tube stations on the Sub-Surface lines have had platforms extended to accommodate S7 and S8 stocks.